A 3.9km prologue. Calling this an uphill time trial is to downplay the effort, it’s an up-mountain race and as prologues go this kind of course is a rarity. With so many contenders for the race not having raced for weeks or more this will give us an immediate test of form. 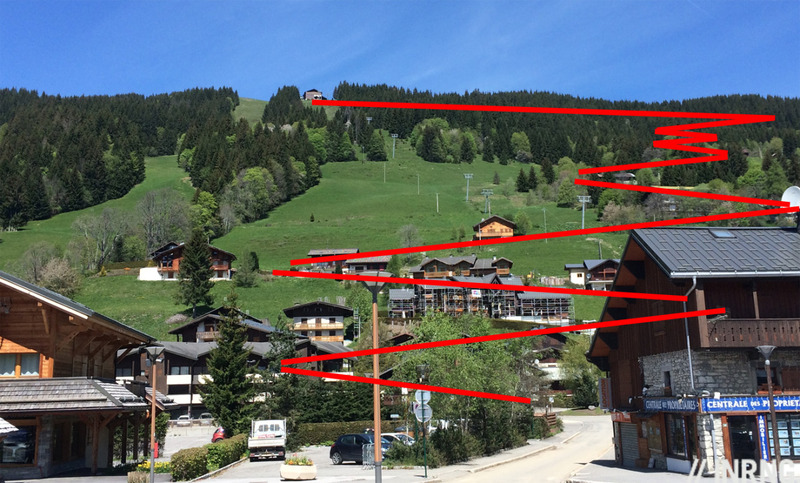 The Route: Les Gets is a ski resort which doubles up as a big mountain bike destination in the summer where the ski lifts are opened to carry bikers to the top of the slopes. No such luck for the racers today. 3.9km up Mont Chéry which roughly translates as “Mount Darling” but there’s nothing endearing about this. A flat start for a few metres and then there’s a tight bend onto the uphill road with 10 hairpin bends along the way. At first it’s on an existing, old road with cracks, sunken inspection covers and an irregular surface. The gradient bites from the start but it will get much steeper. The second hairpin is very tight and shows one of the keys to the course here: a rider can cut the corner and the course short by riding through the apex but it’s very steep. Go wide around the bend though and they’ll add metres. So it’s all about getting the right line, enough to save time but not too much to stall on the inside line. It suits the punchy climbers. As the route climbs up it meets some newly-surfaced tarmac which is great… only here the road is at its steepest as it snakes through a series of steep hairpin bends and almost resembles riding up a downhill ski course. Once they’ve passed the 1km to go banner the slope eases but who will have the energy left to click up through the gears? The Contenders: a short effort. On paper it looks like a pure test of W/kg but the tight bends can make a difference, being able to lean into them and then sprint out of them, or at least to turn on the power to pick up speed matters so it’s . There’s not much to go on in the form guide and the result today will give us a good view of who is climbing fast for the week to come. 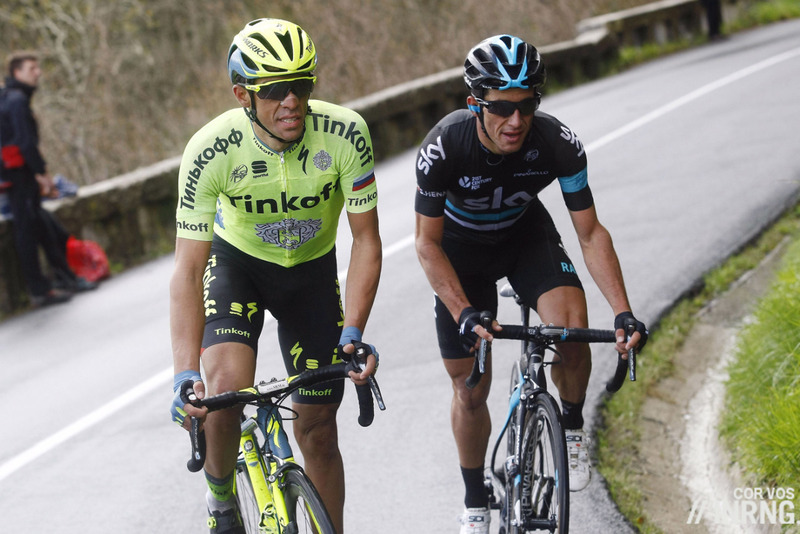 Alberto Contador is well-suited to this effort given he climbs well. He likes to climb out of the saddle too and his “Spanish dancer” routine is ideal for this course given the need to stomp on the pedals in places. He’s not a regular winner of time trials but won the Tour of the Basque Country’s time trial stage which included a hard uphill climb. Who to pick from Team Sky? Chris Froome obviously but we can’t gauge his form yet. Presumably he’s in skeletor shape and copes well with irregular climbs. Meanwhile Sergio Henao and Mikel Landa are the other picks, Henao in particular was third in the Tour of the Basque Country’s TT. Adam Yates (Orica) was fourth in the Basque Country time trial and on a day when he wasn’t feeling great so he could shine again here. Riche Porte is another good choice, his smaller build and explosive climbing style makes him well-suited to this kind of effort. An uphill time trial? Given Thibaut Pinot (FDJ) is a climber who has become a top time triallist you might like him for today but this is probably too explosive an effort for him. Astana’s Fabio Aru‘s form is unknown but probably a safer pick even if there’s only seconds in it. Etixx-Quickstep have two options. Few are better at steep climbs than Dan Martin while Etixx-Quickstep team mate Julian Alaphilippe is a curiosity, this is surely too long for him but let’s see. Finally Romain Bardet (Ag2r La Mondiale) and Bauke Mollema (Trek-Segafredo) have the explosive power too. Weather: cloudy and cool with a top temperature of 15°Cand the outside chance of rain later which will matter as grip is a concern on the steepest parts. TV: live on TV from 1.30pm to 3.00pm Euro time. It should be available on the same channel you watch the Tour de France and/or Eurosport. If not then cyclingfans, cyclinghub and steephill.tv have schedules and streams. Mountain prologue: prologues date from the 1960s, the first being used in the 1967 Tour de France, a ruse to make the riders do an extra stage in front of the public. The riders raced but it was without consequence for the GC, it just meant someone could wear the yellow jersey on the first proper day. The concept was apparently invented by Paris-Nice race boss Jean Leuliot who put it in his race in 1968 and it was rapidly copied by other event. But an uphill start? This is very rare. The last uphill opener of a major race was probably in the 2013 Tour de Romandie won by Chris Froome and the course had some level sections. The Dauphiné had a couple of hilly prologues in the 2000s each won by Iban Mayo but they included flat sections and a descent too. I like how Jerome Coppel sneakily doubled his chances, even if it’s just on one chainring! Ha, he went in twice by accident, once as a local and then because he can climb and suffer. Fixed now. What chance of getting a short uphill TT during the TdF? I’d like to see the organisers mix it up in grand tours. Could follow it later the same day with a short (70-80km) stage. Maybe for a prologue but the race rarely starts in the mountains as it prefers to visit them later. Stage 18 of the Tour is an 18km uphill TT, not the same but an awkward effort with ever changing gradients. And a descent for the last 2km to really mix it up! Split stages are banned in WorldTour races, but perhaps this opens up a new opportunity for the Tour and Vuelta next year if they are to be on the Europe Tour instead. What about Wout Poels? He can climb and he seems to be a top time trialist to this year. Hard to pick every Sky rider above but he’s another candidate. Froome and Henao have either won on placed highly in uphill TTs so I went for them. Probably >3 Sky riders in the top 10. Is there a time limit on the prologue? If so, that would be brutal on all those without GC aspirations. No time limit on the prologue. And you can crash or have a mech and DNF and still start stage 1 tomorrow if you’re OK.
Can’t believe you missed Wout Poels. This is perfect for him. Just seen someone else commented this. My bad. It is difficult to predict results as this kind of efforts are quite unusual, even if a Valverde or a Purito in his best years would have been obvious picks. Landa has performed well in the Aia wall in Basque country, If he still has the form of the Giro, it might be a good pick. Kontador also likes steep climbs, but I am not sure he is still as explosive as in his first years. I am very curious about Alaphillipe. I won’t be very suprised if he books a great result here. Why do dauphiné stages have such variable start/finish times? Thanks. Today it might be to avoid a clash on French TV with the tennis final. I don’t know if the early finish continues into the rest of the week. And imagine what if Froome was to perform well, when Aru did race 30% more kms than him, this season, and has had more racing days, too! Froome is the *only* rider who performed well despite his notable absence from racing. He’s the only athlete in the top-15 (I didn’t bother checking further…) who has raced less than 20 days this season, according to PCS. A huge majority of the riders in the top-15 have already raced about 4000 mks – or more – during the current season. There are just three exceptions, besides Froome: Adam Yates and Mikel Landa, with some 3500 kms; Kwiatkowski with some 3000 kms (one could argue that much more of those where *high-intensity*, because of the strong presence of Classics which he was racing to win). Froome has raced 2655 kms. Luckily enough, Aru didn’t perform well: that would have been totally eyebrow-raising, wouldn’t it? Thanks for the additional information on kilometers raced so far, interesting. I do not see Froome any different in this regard, although others might given the respective team backgrounds. You’re right, Aru did not look good anyway. I was out riding and only caught the two 8min videos on Steephill on the last riders. While I guess the long and hard training blocks partly done at altitude require the necessary rest to achieve the desired stimulus/response mechanism without an odd race thrown in, I am generally not a fan of longer absences from the sport. Seems a strange sport to me where top athletes do not compete for extended periods of time, then do a tune-up event and then their yearly goal (TdF). Plus to me it just seems nicer if you follow a rider throughout the season and can see their progress/improvement rather than them turning up just in time after longer absences. I think it would limit speculation on whatever they did while away, too. But maybe that’s what you need to do nowadays to be up there. Agreed. I prefer other types of riders and other preparations. However, so it goes… And eventually every rider will be remembered for who he’s been, not only for his victories. …and what’s about the Bora guys Emu Buchmann and Patrick Konrad? Hard to imagine to see them winning but I think they are good picks for a top ten result! The poster “Will” (see yesterday’s Who Will Win The Dauphine) has some great information on his website about Alpine climbs. He did a video of this climb too, filmed surreptitiously during the Council workmen’s lunch break ;-), and it looks very steep. Only joking Will, I hope you do some more of these climbs, and the Tour too. Tough to predict these efforts although out of the main players you’d expect Contador to be favourite, possibly Aru if his firm is there. There’s always the possibility of an outside bet specifically targeting this stage too – Dan Martin? Or even the unexpected re-emergence of Pierre Rolland if this effort isn’t too short and brutal for him? Looking forward to this prologue for a change thanks to the novelty of it. how is the starting order of a prologue decided? Starting order for each team is determined by the organisers in agreement with the commissaires; each team shall determine the order in which its riders will start. Inrng got the podium right, in the correct order. Impressed! Froome & Porte got flipped around. Still, this is impressive.